suddenly my eyes focus and snap to attention, and my heart stops. In the window of Denny and George is a discreet sign. It’s dark green with cream lettering, and it says: SALE. I’m sure I’m not the only woman who can relate to Rebecca Bloomwood…right? At her inability to think of anything else but that scarf or that dress or that purse? Of that’s SALE??? Sometimes I have to stop the blood from rushing to my head. I’m scared. Really scared. When I went to New York in November, I told myself I wasn’t going to shop. Not just because of budget but because I just didn’t feel like it! But when we got to NYC and I saw all those beautiful stores, each calling my name ever so sweetly, I just could not ignore them. I mean, it’s rude not to go in when you’re being invited in, right? So it started off with a new pair of UGGS. But I had to! It was $100 cheaper than if I were to buy them in Toronto. Needless to say, by the end of the trip, 4 shopping days later, I was in tears. I was overwhelmed with mixed emotions. Emotions of pure joy and delight of the many treasures I found. Of the bargains I got! But also emotions of genuine distress. How did I end up buying this much stuff and spending this much money? Oh the anxiety of having to pay the bill later! And this happened when I didn’t feel like shopping. What would have happened had I actually planned to shop? I’m scared now because I’m going to VEGAS in a week and I don’t want to shop. I really don’t. I’m on a tight budget especially after the Christmas holidays. I know what you’re thinking. “So set a budget for yourself or don’t buy anything.” Right? That’s what you’re thinking. That I should set an “intention” for my trip. An intention not to shop. That it’s mind over matter and it should be that simple. But who am I kidding? How could I set such an intention? Especially when I already have the intention of finding my Jimmy Choo sunglasses and breaking the bank for them. That’s already a lot of dollars I’m spending before I even get to Vegas! It’s hopeless. This is one intention I cannot set for my trip. The good news is, I’m not nearly as bad as Rebecca Bloomwood. But that’s why I’m not the main character of a book or the star of a movie. 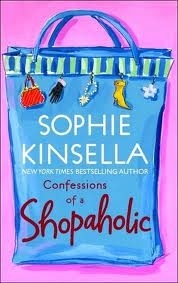 I have to give respect to Sophie Kinsella though, for knowing how to relate to her readers. Naturally, I loved the movie just as much as the book. I remember watching intently, heart beating out of my chest, as Rebecca eyed that Denny and George scarf lustfully. I understood that look. That yearning. But at the end of the day, it comes down to balance. Balance between satisfying your cravings and managing your checkbook. It comes down to the reality of being in real life, not in some book or some movie. At the end of the day, I’m not a shopaholic. I’m just a woman who loves to shop. And I take comfort in knowing that I am not alone.